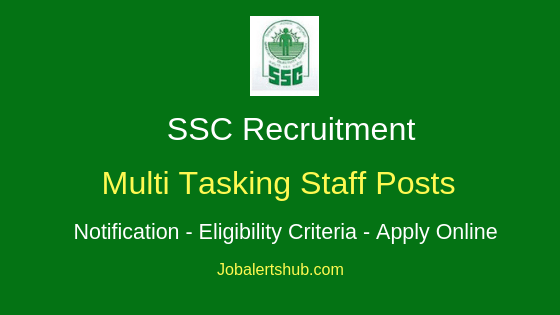 Staff Selection Commission (SSC) India’s premier recruiting agency for various govt. departments and other organizations. 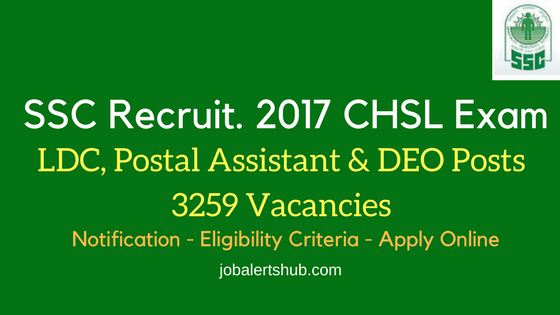 On 18.11.2017 under SSC Recruitment 2017 CHSL Exam announced 3259 vacancies to fill LDC, Postal Assistant & DEO posts. Candidates who passed in 12th class were eligible to apply for the announced vacancies. Three tiers of individual exams will be held to finally select the candidates on performance based. Candidate who passed in Tier-1 will be eligible to attend Tier-2 and so forth. Followed by merit-basis, cut-off marks, certification verification and medical fitness tests and other laid down selection criteria announced in the SSC Recruitment 2017 CHSL Exam notification. Final list of candidates are appointed for the desired post with Pay band of Rs. 5200-20200 per month. Age Limit: Job applicant applying for the above posts should have age 18-27 years as on 01.08.2018 (Candidates born not before 02-08-1991 and not later than 01-08-2000). And for candidates from reserved category, PWD, Ex-servicemen and for categories age relaxation of upto 15 years is applicable. Education Qualification: As on 01.08.2018. The applicant must have passed 12th Standard or equivalent examination from a recognized Board or University. Selection Process: LDC Postal Assistant & DEO Candidate for the Staff Selection Commission SSC CHSL (10+2) Exam 2017 will be selected for the aspired posts solely based on three level of exam held by the commission include Computer Based Examination (Tier-I), Descriptive Paper (Tier-II) and Typing Test/ Skill Test (Tier-III) and other selection criteria mentioned in the notification. Application Fee: Women candidates of all categories and candidates belonging to Scheduled Caste, Scheduled Tribe, Persons with Disability (PwD) and Ex-servicemen (ExS) eligible for reservation are exempted from payment of fee. As for other candidates who are not exempted need to pay application fee of Rs. 100 through SBI Challan/ SBI Net Banking or by using Visa/ Mastercard/ Maestro Credit/ Debit card. How To Apply: Candidate need to visit http://ssc.nic.in/ and click on “Apply” link and Select “CHSL” option and then “Apply Now”. 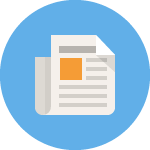 Candidate before applying for the post, need to Register at SSC site and then move to online application form and has to enter all requisite details. After completion of online application, candidate need to make payment through SBI Challan/ SBI Net Banking or by using Visa/ Mastercard/ Maestro Credit/ Debit card on or before announced payment dates. Online Application & Fee Payment Begin Date: 18-11-2017. Online Application & Fee Payment End Date: 18-12-2017 by 05:00 pm. Starting Date for Generation of SBI Challan (Offline): 18-12-2017 by 05:00 pm. Last Date for Payment of Fee through SBI Challan: 20-12-2017.